This beautiful vintage inspired double layer birdcage veil is custom handmade to order with a layer of Russian netting, covered by beautiful soft bridal illusion tulle. The layers are hand sewn to a silver metal comb. 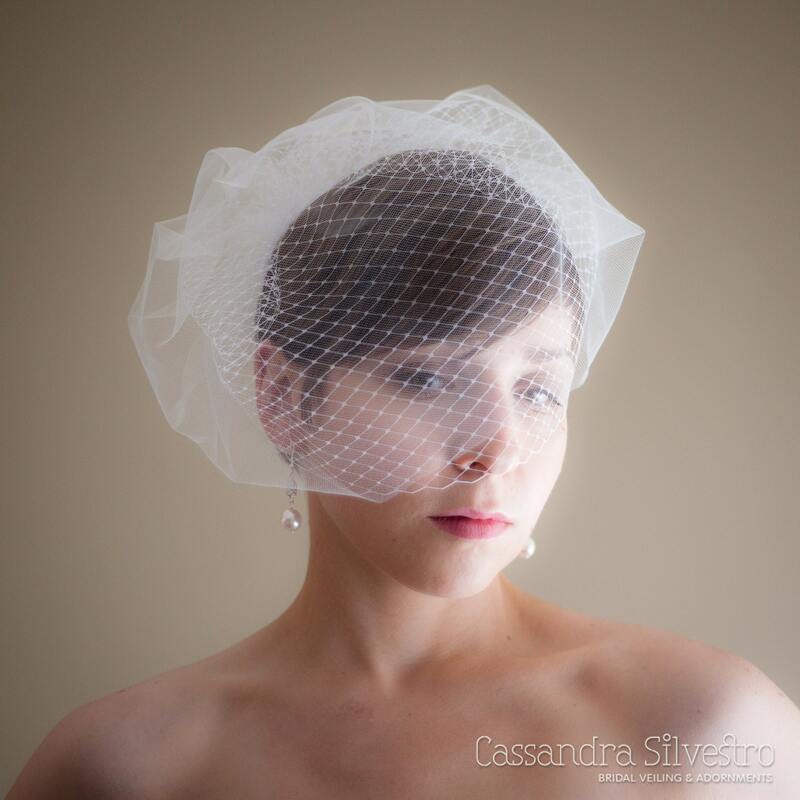 The veil is shown in white Russian netting with diamond white illusion tulle. This piece should arrive approximately four weeks after placing your order. If you need it sooner than that, please contact me about a rush shipment. 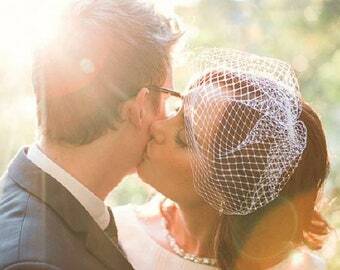 We had a rock 'n roll wedding and this was perfect! This was the perfect way for me to select the colour for my veil. It reached me super fast and came in the prettiest hand written envelope! I accept PayPal, Etsy gift cards, all major credit cards. It is of the utmost importance to me that you absolutely love your veil and feel gorgeous wearing it on your special day; so if for any reason you aren't 100% satisfied, I will be happy to issue an exchange or refund. P.S. I have had very few returns or exchanges because almost everyone loves their veil, but rest assured that the ones that have come back are never re-sold to you; they are used as samples for photo shoots; the veil you receive will always be custom hand-made to order especially for you! Each piece is shipped in eco-friendly packaging, carefully wrapped with tissue paper to protect it during its travels. Items are shipped within the US and Canada via USPS/Canada Post. Standard shipping takes approximately 3-4 weeks to arrive (1-2 weeks for me to make the veil and 1-2 weeks for it to ship) and is the most economical option but does not include tracking. If you are in a hurry and would like tracking then you can upgrade to Xpresspost or Rush shipping options. Items are shipped internationally via Air Mail with Canada Post. The packages do not have tracking but typically arrive about 2 weeks after shipping.